Aethelwold is generally said to have been born in Winchester in AD 909. 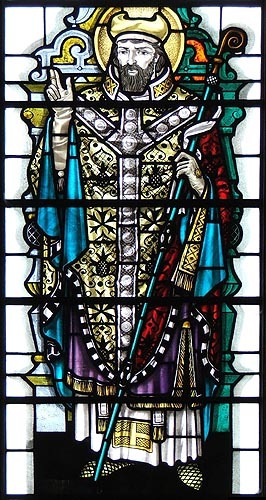 During his youth, he became a member of the King Aethelstan's Royal household and was ordained a priest by Bishop Aelfheah of Winchester around AD 938. After the death of his patron, the King, Aethelwold's career changed direction as he withdrew from Court life to became a monk at Glastonbury. He became firm friend of St. Dunstan there and, together, the two spent over a decade studying religious texts like the psalter, the writings of St. Aldhelm and the Benedictine Rule. Aethelwold had hoped to go to the Continent and see the new forms of monasticism at work in Cluny and elsewhere. However, in AD 954, he was called forth from his isolated life and asked by King Edred to restore the delapidated old monastery at Abingdon. Aethelwold obediently took up the post of Abbot and, with the help of a number of his Glastonbury fellows - notably Osgar, Foldbriht and Frithegar - he set about increasing the abbey's endowment and rebuilding and rededicating the church there. He sent Osgar to Fleury-sur-Loire to study the new Benedictine rule at first-hand and began to introduce its reforms at Abingdon. As the chief academic of the age, he was sent Prince Edgar, the younger son of King Edmund the Magnificent, to educate at the Abbey. Other pupils, included the authors, Aelfric and Wulfstan. A number of Aethelwold's scholarly works survive or are known from other sources: the Old English psalter gloss in the 'Royal Psalter', the corpus of glosses to Aldhelm's prose 'De Virginitate', an English translation of the Regula St. Benedict, 'King Edgar's Establishment of Monasteries' (a preface to the Benedictine Rule) and the 'Regularis Concordia' issued after the AD 973 Council of Winchester and used by all reformed English Benedictine monasteries. In AD 963, after Prince Edgar had succeeded to the English throne, he appointed his old tutor to the prestigious Bishopric of Winchester. It was during his time there that Aethelwold was able to speak out on behalf of his monastic reforming beliefs and he became the principal advocate of the new Benedictine movement which dominated the late tenth-century England. The King supported him in the expulsion of the secular canons from Winchester's Old Minster and they were quickly replaced with Benedictine monks from Abingdon. He was a vigorous reforming Bishop for twenty-one years, re-founding abbeys and priories across the country under the new Benedictine rule: new Minster (Winchester), Nunnaminster (Winchester), Milton Abbas, Peterborough, Ely, Thorney. He also initiated an extensive programme of refurbishment and rebuilding work at the Old Minster, transforming it into one of the largest churches in Europe. He greatly increased its prestige by translating the relics of St Swithun to the interior on 15th July AD 971; and the place became a major centre for the arts, both musical and illunminatory. The Old Minster's scriptorium was famous across the known World for its beautiful 'Winchester style' manuscripts, while Aethelwold himself was a keen metalworker. Aethelwold was not universally popular, however, especially because of his support for his friends such as King Edwig's rejected wife, Aelfgitha, and King Edgar's second son, Aethelred. His strong views brought him into the political limelight and arguments with Archbishop Oda and his successor, Dustan, did not go down well in certain quarters. He was at least once the victim of attempted poisoning! He still managed to survive to the great age of about seventy-five though. Latterly, he suffered with a bad stomach and legs, eventually dying on 1st August AD 984. St. Aethelwold's cult was popular in Hampshire, but was not widely revered elsewhere.